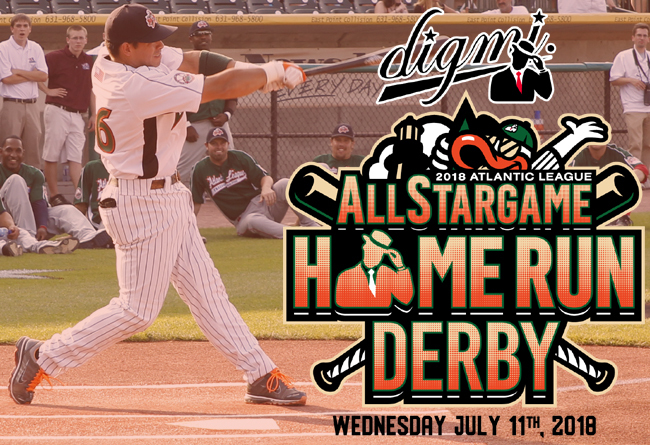 (Central Islip, N.Y., April 17, 2018) – The Long Island Ducks today announced a partnership making lifestyle clothing brand Digmi the exclusive sponsor of the 2018 Atlantic League All-Star Game’s Home Run Derby. Fans will be treated to the special event, featuring the league’s top power hitters, on Wednesday, July 11 prior to the start of the All-Star Game, presented by Good Samaritan Hospital Medical Center. Digmi was founded by Navarrete, who hit a Ducks franchise-record 137 home runs during his Ducks career (2006-13), in 2004. The New Jersey native was bestowed the nickname “Digmi” by his teammates while playing in the Pittsburgh Pirates organization, and the name emerged into a fashion clothing line. The merchandise has been worn by several Major League Baseball and Atlantic League players along with numerous celebrities. Digmi made its debut in several national clothing retailers, including Bloomingdale’s, Tilly’s and Lids, in 2017. The company’s logo, as well as the Home Run Derby logo, features “The Guy in the Tie”. The dapper dressed man tipping his cap has become synonymous with Digmi, and this year, fans will be able to “tip their cap” to the Atlantic League’s best sluggers. All-Star selections from Atlantic League’s Liberty and Freedom Divisions will be selected to participate in the showcase event. Navarrete will be in attendance and co-emcee the Home Run Derby from the playing field. In addition, fans will also be able to purchase Digmi merchandise at the Waddle In Shop during the All-Star festivities, and throughout the 2018 All-Star Summer. Further details regarding the Home Run Derby format and participants will be announced at a later date. Stay tuned to LIDucks.com for more info as the All-Star Game approaches. The Atlantic League has been a leader in professional baseball and a gateway to Major League Baseball since 1998. Over 38 million fans have attended Atlantic League games, and more than 900 players and 50 managers and coaches have joined MLB organizations directly from the ALPB. The Atlantic League emphasizes winning baseball, showcasing the talent of top-caliber players and offering affordable family entertainment.